Are you feeling drained? Do you get tired easily? Are you getting irritated by everything and anything at work? You may need some time off. If you set your alarm early just so you can press the snooze button, then the first thing you do in a morning could be the biggest sign that you’ve had enough. If you’re normally frantic in the morning, and end up being late, you need to take some time away. Do you finish work and want to go straight to sleep, because you feel depleted? Do you lack any type of hobby or time with those closest to you? Just relax, go to the gym, cook and talk to your family – it’ll help. Do you toss and turn at night because of inconsistent sleeping patterns, thinking of something that happened at work? You’re probably over stressed. Once the week is over, and work is done, you feel free on a Friday. Nope, you need some proper rest. If your family or friends ask how work is, and it may be the first day or years in – but you answer with ‘Fine‘. That’s a big sign that you’re not enjoying it. 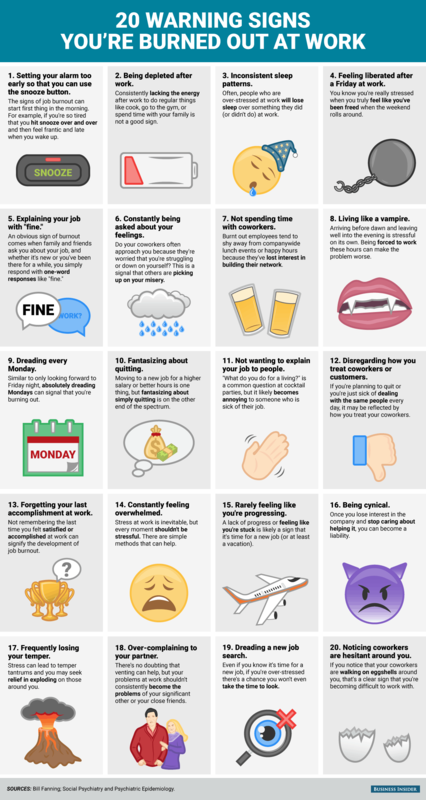 Do your co-workers pick up on your misery and ask how you’re feeling? It may be because you’re not feeling the way you should be. Your network is one of the most important element of any job, so if you shy away from company trips or lunches with co-workers, you need a break. We don’t mean in a bitey-neck type way, but do you feel like a vampire, by arriving at dawn and leaving in the evening? Have a switch up! If you live for Friday and dread Monday, it’s time to take a few Mondays and Fridays out. You can dream about moving to a job with a higher salary or better hours, but if you often fantasise about quitting, there’s an issue. Do you find yourself at parties not wanting to talk or explain your job? You need new territory. If you’re sick of your job and don’t want to be there anymore, you’ll be treating your coworkers in a fashion that you shouldn’t be. That could be a big sign. Accomplishments should be remembered and if you forget them, it’s a sign of possible burn out. Getting into stressful situations at work is a given, but if you feel stressed at everything and overwhelmed, you need to take note. When was the last time you progressed in your job? Take a vacation and go somewhere, if you feel like you’re going nowhere. If you’re a cynical so-and-so, and have stopped caring about the company and the work you produce – you may just become a hindrance. Are you frequently getting angry at work and losing your temper at people or situations? You may need a break. It’s fine to vent or rant to a friend or partner every once in a while, but if it becomes a staple part of conversation and you’re over-complaining, you need to stop. If you hate your current position, but you’re over stressed, you may not put aside time to search for a new opportunity or start a job search at all. You’ll just be stuck in the same rut. Do you feel that coworkers are being hesitant and walking on eggshells around you? You may be difficult to work with. Do you suffer from any of these? Let us know in the comments below!